THE ROAD TO KHALISTAN: REPUBLIC DAY - LOL! I realise, as I write this that it's already 27 January in "The World's Largest Democracy." OK, just a small jab by me. I have decided this is a good occasion for me to give some gifts to my loyal readers, as well as the Indian agents who regularly read my scribblings. Clicking on either picture will take you to my Flickr account. This is my answer to my picture of my impression of the Sacred Sarovar in June 1984. This is not a literal picture, although it does look remarkably similar to what I saw back then. Credits for the picture are at the bottom of this post. Now, as I have said before, I get many weird and wonder things in my inbox, ranging from offers to enlarge an anatomical part that I do not possess to the occasional odd death threat to the truly wonderful. As usual, if I find something particularly striking to me, I like to share it with you. The following letter brought me much joy. I hope it chardi kalas you up, as well! The New Year is here. Please let me take this opportunity to wish a Happy New Year to you and your family and the Khalsa Panth. May 2010 be your best year yet. I wish you health, joy, prosperity, and above all, freedom. The flame of freedom continues to burn brightly in the heart of the Sikh Nation. No force can suppress it. Guru Gobind Singh blessed the Khalsa Panth, saying “In grieb Sikhin ko deon Patshahi.” (“I bless the Sikh nation with sovereignty.”) The Sikh Nation must dedicate this year to working hard to achieve that goal. Self-determination is the right of all peoples and nations and self-determination is the essence of democracy. James Madison, the primary author of the U.S. Constitution and the fourth President of the United States, warned of the “tyranny of the majority.” That is why the U.S. Constitution has strong protections for minority and individual rights and a republican, decentralized governmental structure. India, the self-proclaimed “world’s largest democracy,” is proof that Madison was absolutely right. Without effective protection for individual rights and those of communities and states, the majority runs roughshod over the rights, interests, and lives of the minorities. India does this to Sikhs, Muslims, Christians, Bodos, Assamese, Manipuris, Dalits, and so many others. It is time for the Sikh Nation to flourish. Sikhs have suffered too much already under the yoke of Indian persecution since independence, especially over the past 25 years. We have seen the attack on the Golden Temple, over 250,000 Sikhs murdered and over 52,000 held as political prisoners, the murder of the Akal Takht Jathedar, more than 50,000 Sikh youth tortured, murdered, then declared unidentified and secretly cremated, their bodies never returned to their families. Their families continue to suffer. We must help their widows and orphans. Let us find the vision to throw off this repression. With that vision, the Sikh Nation will flourish; without it, we will perish and India’s effort to eliminate Sikhism will succeed. The sooner we can liberate Khalistan, the better. 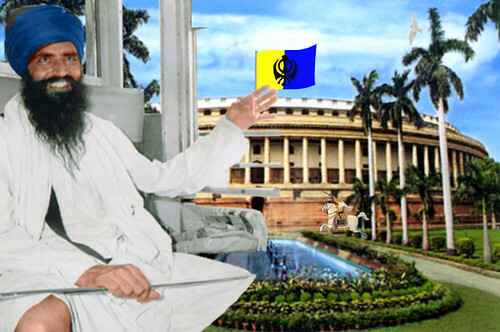 The Dera gurus are bent upon the destruction of the Sikh religion and they are backed by the Indian government. On December 10 in Ludhiana, they marched with the protection of the state government. When Sikhs protested, one Sikh was shot to death by the police. Many were beaten up just for peacefully protesting the Dera frauds. One Sikh was injured in the street. The police came while he was unconscious, then beat him up with their nightsticks. Last week the Supreme Court ruled that Sikhs are Hindus. Sikhs are NOT Hindus. The Sikh religion was established by Guru Nanak. It has ten Gurus. The last guru, Guru Gobind Singh, gave Guruship permanently to the Guru Granth Sahib. Sikhs don’t believe in the caste system; Hindus do. The caste system is essential to Hinduism. Hindus don’t believe in equality. Sikhs believe all people are equal, including gender equality. Hindus believe women are inferior. Thus, Sikhs can’t be Hindus. At age 5, Guru Nanak refused to wear the Hindu ceremonial thread, the Jannau. Sikhism is the youngest religion in the world and its fifth largest. Hindus claim that Sikhism, Buddhism, and Jainism are all branches of Hinduism. None of them is. I am surprised that they didn’t claim Christianity is a branch of Hinduism too. If Sikhs, Buddhists, Jains, and others are part of Hinduism, why are the Hindus killing and persecuting them? Guru Nanak and Buddha were from Hindu families. Jesus was from a Jewish family. Does that make Christianity a part of Judaism? 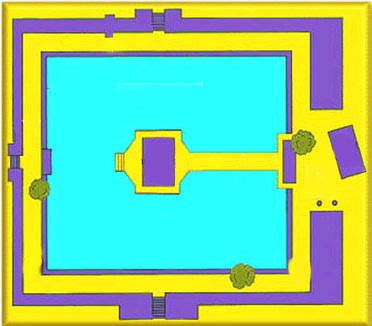 The Golden Temple has four entrances so that persons from any religion and any direction can come to pray there. This oppression will only stop when Sikhs have their own sovereign, independent Khalistan. For the survival of the Sikh Nation, we must have our own independent country. Without political power, religions cannot flourish. Examples are before us. Look at the Jewish people. They were oppressed by the Romans in the time of Jesus and six million of them were murdered by the Nazis. Today, they have their homeland and they are thriving. When Sikhs ruled Punjab, in the 18gth and 19th centuries, our religion flourished. But the British took over in 1849. In the following nine years, the Sikh population declined from 48 lakh to 24 lakh – a loss of 50 percent. Hindu rule has been even worse for our people than British rule. “Khalsa Bagi Yan Badshah.” We must achieve our dream of sovereignty for Khalistan. Jinnah was a smart leader with foresight. He saw to it that the Muslims of the subcontinent got Pakistan. He had more foresight than the Sikh leaders had. The Sikhs took their share with India on the hollow promises of Nehru that we would have “the glow of freedom.” If this is the glow of freedom, I would hate to see slavery. This repression may turn out to be a blessing in disguise. Sikhs never saw Hindus as rulers. They were always oppressed. Sikhs protected them and fought for them. When Hindu girls were taken by the Muslim invaders, Sikhs attacked at night and rescued them. They took them to their homes and treated them as their own daughters and sisters. The Hindus have forgotten all those favors and sacrifices of the Sikh Nation. 85 percent of the sacrifices to free India from Britain were given by Sikhs. The ninth Guru, Guru Teg Bahadur Sahib, was beheaded in Delhi to stop the conversion of Brahmins to Islam. Now Hindus practice forced conversions. Khalsa Ji, let us make 2010 a year of freedom for the Sikh Nation. Do not forget the words of former Jathedar of the Akal Takht Professor Darshan Singh: “If a Sikh is not a Khalistani, he is not a Sikh. The corrupt Akali leadership of Badal has a shameful alliance with the BJP, which has proven time and again that it wants to absorb Sikhism into Hinduism. The recent Supreme Court ruling that Sikhs are Hindus is a testament to that. Khalistan is the only way that Sikhs will be able to live in freedom, peace, prosperity, and dignity. It is time to start a Shantmai Morcha to liberate Khalistan from Indian occupation. We must achieve our freedom by peaceful, democratic, nonviolent means. Let that be the mission of 2010. Sikhs will never get any justice from Delhi. Ever since independence, India has mistreated the Sikh Nation, starting with Patel’s memo labelling Sikhs “a criminal tribe.” What a shame for Home Minister Patel and the Indian government to issue this memorandum when the Sikh Nation gave over 80 percent of the sacrifices to free India. There is no place for Sikhs in supposedly secular India. In a free Khalistan, minorities will have equal rights and all will be respected. Citizens of free Khalistan will be prosperous. Development will take place immediately. The Sikh diaspora will invest heavily in an independent Khalistan. Billions of dollars will be invested. Let us work to make certain that 2010 is the Sikh Nation’s most blessed year by making sure it is the year that we shake ourselves loose from the yoke of Indian oppression and liberate our homeland, Khalistan, so that all Sikhs may live lives of prosperity, freedom, and dignity. Now it is up to us. Do not waste this opportunity. Khalistan Zindabad! May Guru bless the Khalsa Panth. Special thanks to Hardeep Singh and Gurmit Kaur for permission to use the lovely picture of the mother and son. And also to my dear friend (and little sister) Kamal Kaur Badyal for permission to use several of her family members.